This easy tuna panini recipe is loaded with grilled onion and fire-roasted hatch chiles. The melty cheese and spice blend in with the tuna to make this the best tuna melt sandwich ever! Do you love grilled cheese sandwiches? What about a tuna melt? Well, I combined all of your favorite things into one delicious tuna panini! What better way to celebrate Earth Day than a sustainable, delicious tuna panini sandwich? When Wild Selections® asked me to share their tuna fish with my readers, I was excited. Earth day is so important to bring awareness about our environment. I am the one you see at the grocery store with the Safe Watch list out when I am at the seafood counter. Wild Selections® seafood is all certified sustainable. This means that all Wild Selections® seafood uses only Marine Stewardship Council (MSC) certified sustainable seafood. Wild Selections® even make a donation of 13 cents from every can sold to World Wildlife Fund (WWF) to benefit their sustainable fisheries programs and marine conservation efforts. Wild Selections is the only brand to “pay it forward” and act on its belief to take care of the oceans for the future, not just fishing sustainably in the present. The blue MSC eco-label tells you the fish in your can comes from well-managed fisheries and healthy fish stocks. Where the fish is caught is much more critical than how it was caught (limited impact if the fish stock is overfished). This tuna is also Non-GMO Project Verified. Let’s get back to the melty cheese! When the tuna is combined with melty cheese, grilled onion, and the spicy hatch chiles…something magical happens. For this panini, you can use a lot of different kinds of cheese. For my tuna melt panini, I used a flavorful Emmental cheese. It is such a versatile Swiss cheese and it was perfect to pair with wild Selections® Solid White Albacore in water. Panini is usually made with non-sandwich bread like sourdough, ciabatta, and focaccia. Unfortunately, we are gluten free and those breads are very difficult to find in gluten free versions. I used a gluten free bread that our family likes. When you look at a can of Wild Selections Tuna, you can see huge chunks of high-quality fish. This fresh high quality shines through when you use it in your recipes. Are you ready to get cooking? 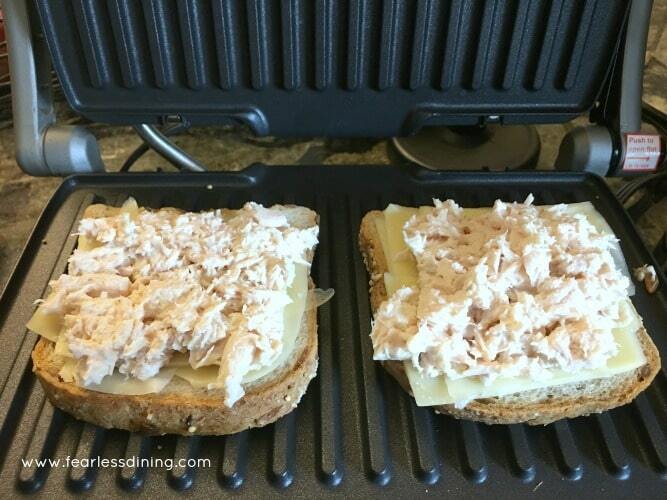 These tuna melt panini sandwiches are so easy to make! Just heat up a frying pan and put your butter side down bread on the pan so that the butter melts into the bread. Add your cheese, tuna salad, onion, and chiles. Put a piece of buttered bread on top with the butter side facing up. Cook until the underside is slightly brown. It is ready when your cheese is all melted and your bread is golden on both sides. Add fire-roasted hatch chiles and grilled onion on top of the tuna salad. Easy grilled cheese tuna melt panini full of sweet grilled onion and spicy hatch chiles. Heat a panini grill, or a small frying pan over medium heat. Next, open tuna can and drain the water into the sink. Scoop the tuna into a bowl and add mayonaise, salt, and pepper. Mix well. In a small pan, add olive oil. Add onion and saute until golden. Prepare your hatch chiles. You can also use canned green chiles in the store if you prefer. Butter one side of each slice of bread. Put two slices butter side down on the pan. Next, add a layer of tuna fish. Top the tuna with grilled onion and chiles. Add a slice of cheese on top. Cover with the top piece of bread. Make sure the butter side of this slice faces upward. Check the bottom slice of bread that is touching the heat. When this slice looks golden, flip the sandwich with a spatula to cook the other side. This is ready when the cheese is all melted. This looks like perfectly cheesy comfort food! This tuna panini looks absolutely delicious!! Such a great lunch idea for work or on the go. Pinning to save for later. Thank you so much Neli :-). You are so welcome Laura :-). I love that Wild Selections donations to the World Wildlife Fund. I didn’t know this! And this panini looks so good! I think I’ll plan this for a weeknight meal this week! I love supporting companies that give back. Thank you for stopping by Patty :-). Mine is brand new and I think I am in love with the panini maker. It makes sandwiches so good! Yum. Tuna melts. I haven’t had one since I was in my 20’s. Your panini looks so delicious! I will by trying your recipe soon!